Having pets is proven to reduce anxiety and stress levels, helping us to live healthier, happier lives. But, if you’re a pet owner, you know that owning a pet isn’t always so stress-free. Dogs and cats can do a number to a home, especially one which isn’t prepared to house pets. If you’re reading this article, you’ve likely experienced the damage pets can manage to floors. 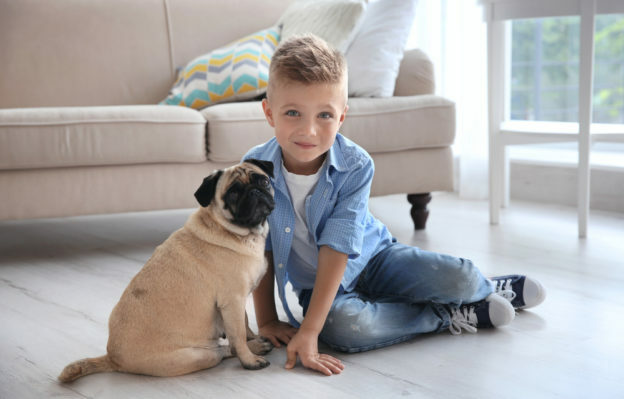 So, whether you’re remodeling or looking for a better solution this time around with a brand new home, you may be wondering about pet resistant flooring. Fortunately, there are a few options to choose from. Essentially, it’s up to you to weigh the pros and cons of each type so that you can select the best option for you, your family, and your pets. You may think that carpet is the best solution for your pets since it provides a cushion. And, you’re right about comfort. If you have older pets who need a cushioned surface, carpeting is your best bet. But, as many pet owners will tell you, the carpet may not be the best choice for all pet owners. That’s because it can be challenging to clean, holds moisture (urine included), claws may get snagged, and traction can lead to damaged areas. But, there are some pet resistant carpeting options, designed specifically for pets. Who doesn’t love a beautiful, classic wood floor? While it may look beautiful upon installation, it may not after several years of owning a pet. Wood is not water resistant. And, leaks and spills come with owning a pet. If you’re determined to have wood floors, it’s best not to keep your pets who are not potty trained in areas of the home with wood floors. Also, wood flooring can be softer than other flooring options like tile. So, they’re more prone to scratches, especially for a home with pets. If you are going to choose wood flooring, to best prevent scratches, choose a wood which is harder like oak, maple, or hickory. If you like the look of wood floors but don’t want to have to worry about the high price or scratches from pets, you may want to consider laminate. It’s a less expensive, easy-to-maintain option. And, it’s relatively impossible to damage. The biggest concern pet owners may have when it comes to laminate flooring may be its high gloss finish. Typically, laminate doesn’t offer any texture to offer traction. So, pets may slide when running on laminate flooring. This is obviously not a great option for older pets who may have joint issues. Stone flooring, much like hardwood, is a beautiful but costly flooring solution. And, it’s easy to maintain and clean. But, there are some considerations when it comes to pets. Marble and other softer stones may be more at risk for scratching. So, you may want to choose a harder stone for your tiling. These types of flooring can also be quite slippery. This means it might not be best for pets who like to run, run, run! If you’re looking for the flooring solution which offers the most pros when it comes to pet solutions, bamboo is your way to go. It looks beautiful, much like hardwood. It lasts a long time. And, it’s virtually indestructible. It won’t soak up liquid and it’s easy to clean. If you have a home with high traffic and need floors which are undamageable, you should definitely consider the pros of a bamboo flooring solution. Whichever flooring solution you choose, you’ll likely need to remove old, damaged flooring first. There are a number of concerns when removing flooring yourself. So, let the professionals at Dustbusters Floor Removal help! To hear more about our dust-free floor demolition and waste removal services, please give us a call today at 866-883-8783.